One of the best routines I began early on in my pregnancy is journaling. I am not someone who normally writes in a journal, but I wanted a way to remember all of the experiences I was about to have, and a journal seemed like the best option. At a little over halfway through my pregnancy, my journal is already a treasure. It is amazing to look back through my journey so far and dream about what is yet to come. I am so thankful that I started journaling right away; although it is not too late for you, no matter where you are in your pregnancy. For someone like myself who is not typically into journaling, starting a journal was intimidating. The first time I opened up my journal and saw hundreds of blank pages staring back at me, I wasn’t sure where to begin, and I honestly felt a little awkward writing down my feelings and thoughts. I started my journal right after I had a positive pregnancy test. Not sure where to begin, I decided to just jump in and start writing to see what I came up with. Using a blank journal has allowed me the freedom to write as much or as little as I would like. I have been able to organize it in a way that works for me as I reflect on my pregnancy. The basic format I follow in my journal is to create a new section for each week of my pregnancy. I label the page with the day of the week, date, and the number of weeks pregnant that I am. Underneath of that I write a variety of things. No matter how you decide to do it — a blank journal or a pre-made pregnancy journal — I encourage you to start a pregnancy journal as soon as possible. Whether you are five weeks pregnant or 25, it is not too late to record your memories. There is no right or wrong way to organize and use your journal. Do what feels right for you and record anything and everything that comes to mind. What seems silly or trivial now will most likely be a treasured memory down the road. Make sure to leave space for adding sonogram pictures, weekly/monthly bump pictures, and any other keepsakes you have. Maybe it’s the “pregnancy brain,” but I already feel like it’s hard to remember my exact thoughts and feelings during those early weeks of pregnancy. It is so wonderful to be able to turn back the pages in my journal and relive them. I can only imagine how meaningful this journal will be to me in the years to come. How about a free journal to get started? If you’re reading this article, I’m guessing you are interested in starting a journal of your own. (Or, maybe you know someone who might want one.) 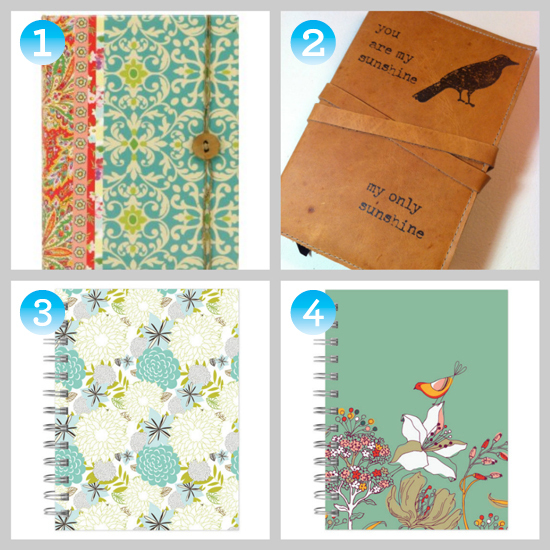 Well, we are lucky enough to have three different journals to give away! 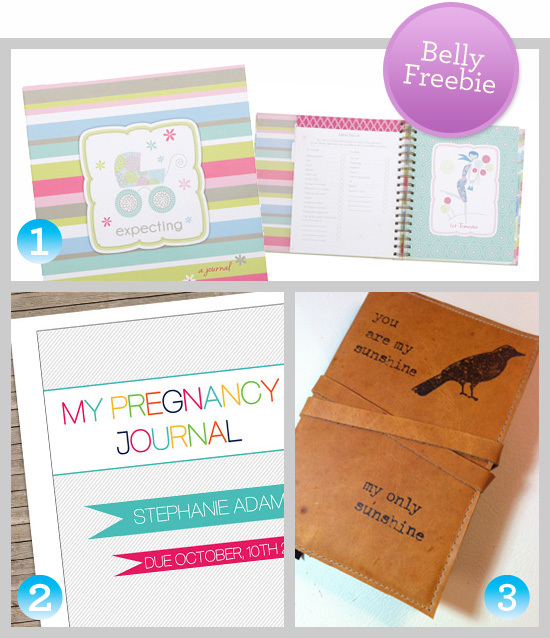 Prizes: The 3 different pregnancy journals featured above. Bonus question: Tell us if you’re new to journaling or need another journal to continue recording your memeories. If the book isn’t for you, feel free to share that. Also, we’d love to know what you’ll record in your journal. Deadline: Tuesday, March 12 at 8PM EST. I’m new to journaling and really like all the suggestions of what to write. I think I’d also record all the funny names I’ve given my baby while he’s in the womb like “Lil’ Viking” because of his fierce kicking style or “Dude” while watching the Big Lebowski. Jenny, “The Dude” is the greatest nickname ever! Thanks for entering and good luck! Jenni, I love the idea of adding the funny little nicknames for baby. I am definitely going to start doing that. Thanks for sharing! Get my journal started! I would love to win this for my daughter who is expecting our first grandchild. Get my joural started. I would give this to my niece that is expecting. Oh my goodness! Ginny, I am so surprised and happy to see this. Congratulations!!! I think you will really enjoy keeping a journal. I just had my baby boy 3 months ago. I want a journal to start tracking his milestones! I’m ready to get my journal started for my soon-coming little one. And I am in love with the leather you are my sunshine journal. So fantastic! I like the monthly onesie stickers with red and blue dots. I’m looking forward to my little one’s birth – the first big milestone. I didn’t journal with my first baby, but I’d love to journal with this one. I have always journaled but this would be for one of my daughters when the time comes. I have been journaling for my kids for a long time. I really enjoy writing down what they are up to, things they are learning and any milestones they have hit. 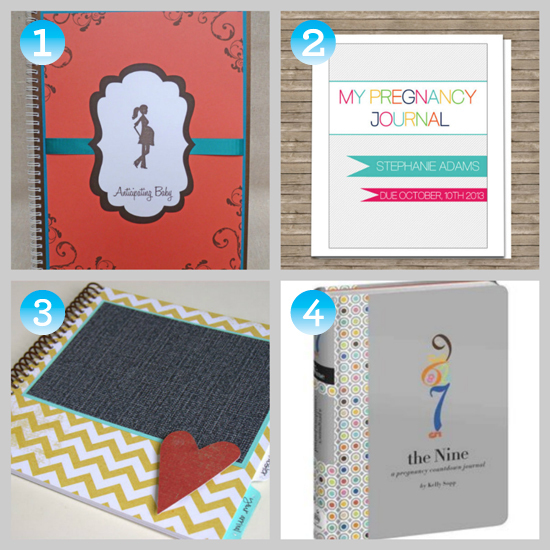 I am pregnant with baby #5 and haven’t gotten a journal for the baby yet! I have used a pregnancy journal and its been nice to look back and compare my pregnancies. I have also used blank journals that I use during pregnancy and continue in for that child after they are born. I have never “journaled” before, but I am in the process of TTC. It’s been many years of struggle for me, but I am very hopeful. I would write everything in my journal about my experience while TTC and during pregnancy if I am lucky enough to. I go through journaling phases. This would be for me, as I am currently TTC, which is also something I would like to journal about. I have never journaled before, but have wanted to start. I am currently 18 w pregnant with my first… and want to remember everything!